My neck has been hurting the last couple of days. I should have been able to use the neck stretching appliance that was given to me by the physio clinic. I say should have because I had to send it back. The insurance wouldn't cover the rental of it. They started sending me bills for hundreds of dollars. You should never knock the NHS because you don't realise how brill it is until you haven't got it. The health care system here is ridiculous. Health insurance costs an absolute fortune and then when you need something they say "Oh that isn't covered" and send you a big bill. Or, if you are sent for a test for something they will say it is only partly covered and send you a big bill. If you have an existing condition ........they won't cover you at all. So, if you need tests, doctors or hospitals it will cost you thousands of dollars. An English friend of mine was very poorly last year and was in hospital for weeks. She then had to have rehab and ongoing treatment. People find it hard to believe that over here, she and her husband would have lost everything. Even with insurance they would have had hundreds of thousands of dollars worth of bills and would have lost their house........everything. Plus there is no way she would have been able to get any insurance afterwards. A friend of ours, here, had a heart attack a couple of years ago. He was in hospital for a while and needed surgery. Afterwards........he had to declare bankruptcy as his hospital bills were more than $500, 000. We pay a lot in insurance but we still have to pay on top for any doctor visit. We are not allowed more than 2 preventative procedures a year.......or we have to pay. By preventative I mean blood tests, mammogram etc. The bills are amazing....they list everything and everybody you see. All have to be paid. I went to the doctors a while ago because I had a dodgy ear. She sent the nurse in to syringe them. They sent me a bill for the nurse and the procedure of syringing my ears. 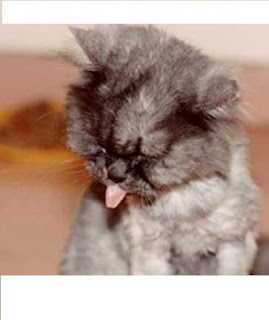 Philip had one ear syringed and the bill was $300. Another friend of mine is diabetic. She pays a fortune for insurance and still has to pay $500 a month just for her insulin etc. I think she only gets any insurance because she already had it before she developed diabetes. So, if any of you ever get cross with the NHS please remember that some places, like here, you literally can't afford to be sick. It really is a nightmare at times. Rant over.......coo......that was all brought on by my bad neck. It is such a great evening out and not too expensive. We had brill seats which cost around $18 each. That would be about 12 pounds I think. You get a lot for that though. The entertainment, apart from the hockey, is a lot of fun. Started with the Admirals pirate ship which fires T shirts into the crowd. 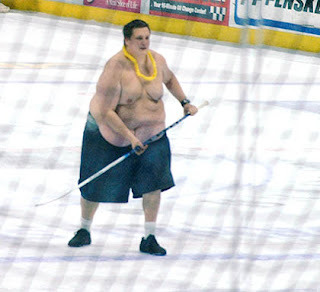 During the first break we had The Human Hockey Puck competition where people choose to be fired by a big catapult, the length of the ice, to try to knock down the most pins at the other end. Then we had the little kids come on to do their bit of hockey. They are so tiddy and half of them end up going the wrong way. The next break we had the cheese tub race. There is also a blimp which flies around the arena dropping coupons and tickets on the crowd. This was the opening game of the season and I love checking out all the new players names. We have a priceless one this year. Either his mother had a sense of humour or his dad wanted him to grow up tough. His last name is ......Rabbit.............his first name is...............Wacey. There were the customary punch ups which were celebrated as the highlights of the game. They are repeated on the big screens accompanied by suitable music, although one time they showed the fight with Tiptoe Through The Tulips by Tiny Tim..........it didn't make sense but was so funny. The Admirals did win, although in extra time. 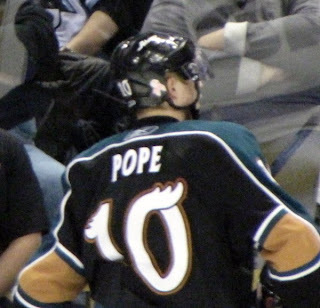 This was rather surprising as it seems The Manitoba Moose had the pope playing for them. Had a letter from Lukewarm today. He was in good spirits when I saw him during my visit to Blighty. I was hoping that maybe some bridges had been built and that maybe hurt, raw feelings would subside given time. It seems this isn't the case. I do hope things improve for him as this bitterness can't be doing anyone any good. He did wrong, he knows that, but he is paying a terribly high price. I had already sent him a letter but they must have crossed. I hear there are postal strikes over there so it might be delayed. I will send off another one. I hope the above picture doesn't offend anyone. Well, seeing it all "live" offended me a bit. Put me right off my chips. We are off to Ice Hockey tomorrow. 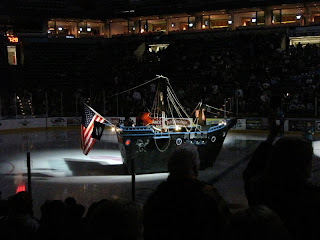 It is the Milwaukee Admirals opening game. They are playing The Manitoba Moose.......or should that be Mooses.......or maybe Meese. I love the first game of the season as they give out freebies. Usually we get a fridge magnet schedule and maybe a flag. We will be meeting our friend Gary there and with any luck, The Admirals will win. Well, if they don't win at least I hope there are a few goodly punch ups. I hope they don't do any more "fat guy" competitions. I will let you know. Whatever it is..........he's agin it. We seem to have more than our fair share of odd people here in Milwaukee. They do make life a little more interesting though. This morning I was off to the Mall. I walked round to the bus stop which was no longer there. There were big earth mover thingies there. There was also a rather large hole there. There were construction men in hard hats. What there wasn't was a bus stop. After making enquiries with a somewhat hunky looking guy with big boots I was directed across the road to a temporary bus stop. Where I was to find our latest eccentric. I am being rather kind calling him that as he was not being kind at all. He was pacing up and down by the traffic lights, outside our chemist, Walgreens, carrying a banner. He was waving this thing at all the passing traffic and those that had stopped at the lights. I wondered if anyone had been in to tell the poor pharmacist about this guy. I decided that someone probably had and made sure I didn't make eye contact. What can be the reason ( if one is needed) for someone to do something like this. It wasn't as if he had been sold a duff car or something..........we have seen someone else with a banner protesting outside a car showroom about being sold a lemon. Maybe he trawls through criminal records to see if he can find something on someone and then takes up, what he believes to be a campaign. Sad man. Probably hadn't taken his medication. I went to the Mall at 11 am. When I came back, 3 hours later.............HE WAS STILL THERE. He must have been frozen. This afternoon, using ingredients I brought back with me, I made my Christmas Cake. The fruit had been soaking in sherry for 3 days and smelled good enough to eat on it's own. I am making some dear little ones for some friends too. I shall have to start feeding them all brandy........yum. No more dreams of candy bars.......thank goodness. Oh what a sweet, gentle little kitty. She would have you think so. Yesterday it was the dreaded yearly run to the vet's so that the kitties could get their vaccinations. It is like a military operation. There is much planning involved. Looby Loo (the former feral cat) needs only to get a snifter of a cat carrier being moved and she will disappear into the deepest, darkest depths of this house ........probably the basement.......never to be found. We have come up with various plans for capturing her before she realises something is afoot. Anyway, amazingly I got her into the dining room, but as soon as I closed the door behind us she knew that the trap had been sprung and the bloodcurdling, heart rending screams of "NO" started. She really does scream "NO".......and she doesn't stop all the way to the vet's. Lollipop was an easy catch and then off we went. We have to do two shifts as we can't manage 4 cats in one go. First two at 10 am......second two at 11 am. At the vet's it was plain sailing. Looby Loo curls up into a tight ball, like a hedgehog, and the vet can look at her eyes, ears etc.....twist her this way and that ........she doesn't move at all. Lollipop was scared but ok.
Back for the other 2. So far this was a piece of cake.............oh hapless human ......what was I thinking. Bubba and Lily jump into the carriers as soon as we set them down. No need to catch them at all. Bubba........hmmmmmmmmm.......he was pretty good but since he had a tooth out one time he gets miffed if they try to look in his mouth. He growls a bit and you know he is becoming irritated. Anyway, he was done.....back in the carrier.......now to Lily. Sweet little, fluffy, cuddly Lily. "Oh what a gorgeous kitty" said the assistant .......soon to lose this innocence. Well, she was ok for a bit .......right up to the bit when the business end of the needle was going to be stuck in her bum...........then SHE EXPLODED!!!!!! SHE EXPLODED INTO THE HELL CAT THAT SCARED SATAN OUT OF HELL. She was just a mass of teeth and claws. Assistance was needed ...quoth the vet. In came a robust girl with leather bracelets who looked like she did car repossessions on the side. "Do you want gloves?" enquired the vet. "Nope.....I will scruff her" came the confident reply. "Oh will you" smirked Her Royal Highness Princess Lilibet the Third. Well, I give her points for trying. Lily produced an even bigger explosion she took off from the table, bounced around the room, tried to get into the rubbish bin making a noise that you would not believe could come from a cat....well unless it was a sabre tooth tiger with the mega hump. Reinforcements appeared.......but to no avail........in the end they produced some sort of cat trapping device which grabs the poor kitty, encases it in plastic mesh and enables the catcher to keep it at arms length. This was so very traumatic to all of us. The cat was upset, the vet was upset and we were upset. The vet wrote notes on Lily's records that say next year we must figure out a different plan. She will have to been seen first and dealt with quickly. I personally think I will have to give her something to sedate her before we go (us too if possible). Philip looked like he had been dragged through some barbed wire. His hands were covered in blood .....poor thing.......but did he make a fuss.........of course he did.......he is a bloke. On our return Lily bounced out of the carrier as if nothing untoward had taken place at all....we were still quivering wrecks. Definitely a different plan next year. Oh what a night. You would think after all the drama of yesterday morning that I might have dreamt of fighting dragons or something last night. I dreamt about helping a friend out. I won't mention which friend lest I embarrass Dave. In this dream we were attending a 'New Sweets Convention' and Dave had invented a nougat bar that he was entering into a competition. (This all seemed perfectly natural in the dream). But, he had made this bar and given it to me to find a wrapper for it. There I was running around this convention hall with the bloody nougat bar in my hand. I was so cross. The bar should have been in a fridge and was getting all soft and sticky. He was supposed to have made the wrapper but hadn't. He then told me to find an envelope to put it in. I couldn't find a poxy envelope. I was on the point of telling him where he could shove his nougat bar when I heard the rules announced. He should have put cherries in it and he had put apricots !!!!!!!!!!!!!!!!! There I was trying to squish this bar out, put some cherries in and roll it up again. Was he bothered? Was he buggery. Next time David, you can do your own running around with your nougat bar. I was worn out when I woke up. This is unusual for Milwaukee. We don't get a lot of rainy days. In the spring we get thunderstorms with very heavy rain but it soon passes and dries out. The summers are generally pretty dry. Winter.........well that is just snow. Today it has rained all day and is really dark. I have noticed that it seems to be getting dark way earlier than it should be. The clocks don't go back for another couple of weeks yet it has started getting dark around 5pm already. Philip is back at work and is also bowling tonight. He must be all better then. My thingy on my leg looks a bit yukky. I had to go to the quacks for a yearly check over and whilst there I mentioned the little lump on my leg, down by my ankle. It has been there a couple of months and looks like a pimple. 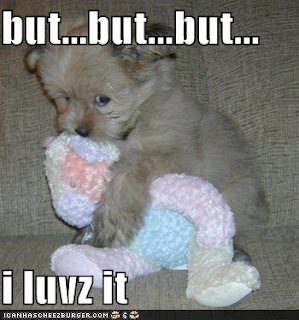 Doesn't behave like one though. A couple of times I tried to squish it but it wasn't having any of that. So, I showed it , first to the quack's trainee who said it was a wart. Then the real doctor came in and said that she didn't think it was. She thinks it is a Dermatofibroma. She told me it isn't scary. She decided to try to freeze it, in case it is a wart. This she did with a spray thingy. It didn't hurt at the time..........note..."at the time". If that doesn't work then I can get it cut out. I didn't like the sound of that but my friend who is the nursing manager said to say "get it excised" which sounds much more pleasant. Shortly after I came out it started to hurt. It felt like a burn. I put some cream on and it hurt all day yesterday. Whatever she did to it...........she upset it at the very least. I don't think the freezing is going to work. I doubt it will drop off. I suppose I will have to get it "exercised" in the end. Do they have gym classes for pimples? Philip booked his flights today. He is flying back with Alan on February 13th, arriving at Heathrow on February 14th. Then it is on to Glasgow to meet up with older brother. On Thursday 18th February it is back to Gatwick and then to Whitstable to visit with the step father. On Saturday February 20th he flies back to Chicago. Especially when you take into account that he will only be there a week. But, it will be very special trip as the brothers have not all been together for more than 30 years. It is just as well I said I wouldn't go as we could not have afforded it. I really hope it all works out well for them. This weekend I shall probably start soaking in sherry, the fruit for my Christmas cake. I usually do this for 3 - 4 days before baking. I brought back the fruit, marzipan and fondant with me from England as I can't get it here. I am also going to attempt to make a Christmas pudding. My mum always made them but, although I make the cake every year, I have never tried a pudding. I remember most of the stuff mum would have out on the table.......fruit, carrot, apple, treacle and of course beer. I don't remember the proportions and she never measured anything. I have found an old traditional recipe that seems to have the same sort of stuff in it so I shall give it a go. Can't get suet here though. I would have used vegetarian suet but they don't seem to have heard of suet at all over here. I read that I could substitute butter, which sounds rather nice. I will have another search but I doubt I will find veggie suet. Last year I made individual, iced and decorated Christmas cakes for all of Philip's team at work. So, this year I am going to make individual Chocolate Yule Logs for them. They don't seem to have these over here either so it should be a bit of a novelty. I have found a recipe for Red Cabbage...........oh the gods be praised. I will definitely have a go at this. Not able to go anywhere this weekend as "him indoors" has to remain "indoors" due to the lurgy. I did walk round to the nearest supermarket to gather up some supplies but it wasn't a lot of fun. Walking round there was OK, but no fun walking back laden with taters and veggies. This afternoon, after watching a couple of Ghost Hunter episodes that were recorded while I was away...............(I don't know why I watch this, it did start off fairly sensibly but has been getting more and more ridiculous lately. The next thing you know they will start screaming all the time like the English version did......ermmmm Most Haunted I think it was called).........anyway, I started drifting off and thinking about some of the things kids say. Lauren is a great source of memorable sayings. This time, while I was over, we had a couple of classics. Lauren..........."Mum do you think everyone has a soulmate? Someone special who is meant just for them?" Donna............ "Yes I think so." Lauren........... "But what if mine's French?" We were watching an episode of " The Crocodile Hunter". We had been watching it quite a long time....it was maybe half way through. Lauren............"They must have made this before he died." Oh poor Lauren. We did laugh and she did get her leg pulled for days after. Tomorrow I am going to do something that I am sure no American will do. I am going to cook a Sunday roast. I don't usually but as we can't go anywhere.........we certainly can't go out for brekkie........then I have decided that is what I shall do. Roast dinners are so rare here. I think it is only me who ever cooks a proper one. They have something similar at Thanksgiving but they don't have roast tatties or yorkshire pud. They have mash and horrid sweet potatoes covered in syrup and marshmellows. Oh my goodness........Thanksgiving isn't until November 26th yet already the TV programmes have started with "How to cook a turkey" "How to have successful Thanksgiving Dinner" etc. It is less work than a regular British Sunday roast dinner but because very few people here ever cook anything, it is a major undertaking. At Christmas they have no traditional dinner. It is anything from lasagne to baked ham. Whilst in England I had a couple of roast dinners out and they were lovely but not as lovely as a home cooked one. So, that is what I shall do to keep myself amused tomorrow. This is Lauren with Tom. You can just plop him down any which way and he stays. He has some sort of flu. I phoned the doctor yesterday and they said he should go in. I was surprised as I thought they wouldn't want people going in there with flu symptoms. But, they said they would not prescribe without seeing him and that he should ask for a mask as soon as he got there. According to my friends back in England they were dishing out Tamiflu willy nilly simply by telling them your symptoms over the phone. Anyway, he has flu but they cannot tell if it is swine flu or seasonal flu. Which makes it seem odd that across the pond they are willing to make a diagnosis over the phone. He has been given Tamiflu and is signed off work until Wednesday. He had the seasonal flu jab a couple of weeks ago but apparently it isn't totally effective for 3 -4 weeks after. I am hoping he has seasonal flu as I had my flu jab about 6 weeks ago so I should be covered. 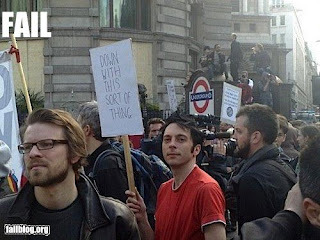 If he has oink flu then .........I just hope I don't get it. We are hoping Alan phones today so that arrangements can be made for their visit to the long lost brother in February. We have worked out some dates and just need to speak to Alan to confirm them. Then Philip can book on the same flights as him. Alan's hotel is closing at the beginning of January and not opening until March 1st next year. This gives him a very long holiday. Philip, on the other hand, has about 5 days he can use. So, he has had to try to factor in the weekends so that he gets as much time as possible over there. They have to fly to Heathrow and then on to Glasgow. Add car hire and a B&B on top and it won't be cheap. But, it will be worth it and sometimes you have to get your priorities right. Alan should be fine as he usually has money to take home with him anyway. After 4 weeks of sunshine......one rainy day I think.........in Blighty, reality has set in. Yes .......it is on its way. There is snow forecast for Sunday. Now, hopefully, it won't be much and it shouldn't stay around for long as it isn't that cold, but I feel as though I have only just put the big coat and boots away. I had to wear the big coat yesterday for my trip to the dentist. That sounds pretty innocuous doesn't it? I think you have to be some sort of sadist to be a dental hygienist. All that poxy scraping and prodding. My teeth hurt all evening. I have them done at least every 6 months, sometimes only 4. She likes me to go every 4 months. She says it is necessary but I think they just want the dosh. What it would be like if I left it longer I dread to think. We were expecting Alan to phone last night. We were hoping he would tell us what dates he has for being over here and when they can go to visit their brother. Maybe he will ring tonight. I do hope so. Back to work today. Nothing much has changed there. It is a little slower than usual so I don't think it will take me long to catch up. I am still wondering what time of day it is. I think I have hurt my back lugging those cases around on the way home. It is my own fault for buying so many supplies to bring back with me. Isn't that a fab bus in the photo? We spotted that on the way back from Essex. Would be brill to be married by bus. That is because he was. Good......just as I like it. It actually didn't seem to take so long this time. Maybe I am just getting used to it. I was sad to say goodbye but it was nice to be home too. Nothing like your own bed, even if the cat to bed ratio had doubled. 2 kitties at Donna's ......4 kitties here. I had really great time in Blighty. It is so much easier to get around over there. Buses, lots of them.....going all over the place. Trains which are easier to get to. Walking........I love walking but think I am probably one of the few pedestrians in Milwaukee. It is colder back here. I know I was very fortunate with the weather whilst I was in England but it is decidedly nippy back here. The heating is on and I needed a big coat on to go round to the shop. The S word will be next. Yesterday it was Dave's chance at revenge. Revenge for giving him Sarthong Plunder all those years ago. Instead, he took me on an adventure. I did something I had never done before and, in all honesty, never imagined I would do. I visited someone in prison. It was not the ordeal I had envisaged it would be. The wardens didn't not have horns and pitchforks. They were rather pleasant, smiley and helpful. After a couple of worrying moments ( you didn't mention rubber gloves Dave.....EVER.) we got to visit with our chum. He seemed pretty upbeat, considering. Dave and I shared a few laughs with him but I have to admit I did get close to tears a couple of times, with things he told us. I had worried about it........just fear of the unknown really.........but it was an experience. Then in the evening I visited another old friend. This would be the last time I see her and her hubby until next year. It always amazes me that another year has passed. We did get together a few times and as with other old friends......I miss her muchly. I had lived in Kent for years but had never been here. The cost was about the same as going to the zoo but........big difference here...........the ticket you buy is good for a whole year. Yup.....you can go back, inside the castle and in the grounds, as many times as you like over the next year. I gave Donna my ticket so now she has 3 tickets she can use all year and that will take her right through next summer. There is the castle to visit, a maze, aviaries full of parrots, birds of prey with displays, a grotto......black swans and......( I have never seen these before)...... a peahen with chicks. I explained to Lauren that the boys are peacocks and the girls are peahens..........after some thought I decided the chicks (as we didn't know what gender they were) must be .... peas ! They have 2 of the dreaded gift shops though. Lauren was in heaven. We escaped with just an ornament of a knight on a horse.